On the east edge of the Sierra Nevada, the busy resort town of Mammoth Lakes sits amidst sparking mountain scenery, close to granite peaks, pine forests, Alpine lakes and several volcanic features, all affording a multitude of recreation opportunities year round. 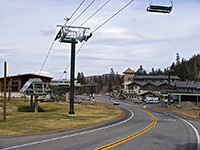 The town is most famous for skiing, the season usually lasting from November to June, when thousands come to glide down the slopes of Mammoth Mountain a few miles west of the town center. The full range of winter activities are available including snowmobiling, sledding and cross-country skiing as well as downhill skiing, all within easy reach of the many facilities in town; although relatively small, Mammoth Lakes has a good selection of shops, restaurants and hotels, and acts as a center for visiting this otherwise little-developed part of California, on the steep, arid, east-facing side of the Sierras. The town is the largest along US 395 for 300 miles, between Ridgecrest and Carson City, NV, and comprises rustic lodges, houses, condominiums and estates arranged around the main commercial center along Main Street (CA 203) and the intersecting Minaret Road (see map). Highway 203 forks off US 395 near the north end of Long Valley, continuing westwards outside town towards the boundary of Devils Postpile National Monument. Although almost all the buildings are modern, the original town of Mammoth was founded around 1878 as a timber and mining settlement, flourishing for a few years before most was destroyed in a fire. The modern day recreation era began in 1953 when the Main Lodge opened, followed shortly afterwards by construction of the first chairlift. 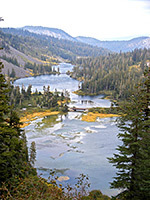 Mammoth Lakes has a fair selection of hotels - follow the link for descriptions and reservations. 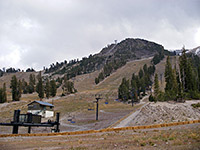 Snow-based action is concentrated on and around dome-shaped Mammoth Mountain, a dormant volcano largely devoid of trees, which rises to 11,053 feet and forms part of the eastern crest of the Sierra Nevada. Around 400 inches of snow falls annually; this, and the wide variety of routes plus the good facilities make Mammoth one of the top ten ski centers in the US. Three gondolas and 24 chairlifts traverse the north and east slopes, based around 4 access points - Eagle Lodge, Canyon Lodge, Mill Cafe and Main Lodge - this latter on Highway 203 (Minaret Road), 4 miles from the town center. All offer lodging and dining, and are linked to other places in town by a free transit system, operating between October and June. When the snow finally melts in midsummer, the mountain slopes are transformed into a large mountain bike park. The lakes of Mammoth receive less attention than the mountain, despite being pretty, easily reached, and close to the Sierra Nevada backcountry, next to trailheads for several paths into the John Muir Wilderness. At the main junction in the middle of town, Lake Mary Road forks south, first passing (after 2.3 miles) the shallow Twin Lakes then climbing to the next and largest (Lake Mary), looping all the way around the shore. 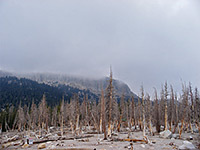 Two spur roads lead to other smaller lakes, most westerly being Horseshoe Lake, one of several locations in the Mammoth area where large numbers of pine trees have been killed by recent carbon dioxide emissions from underground vents - activity associated with the nearby Long Valley Caldera, the remains of an ancient volcano. Other evidence of the continuing geological instability of this region was a 6.1 magnitude earthquake in 1980, an event that caused local property prices to fall sharply and led the town to construct an alternative access route to US 395 (Mammoth Scenic Loop), to be used for evacuation if the main road was blocked. This road passes through thick pine woodland for 6 miles, part of the Inyo National Forest, and has many side tracks leading to places suitable for free camping. Besides the Sierra Nevada wilderness areas to the west and south, Mammoth Lakes is also close (within an hour's drive) of many other interesting sites, and because it has the best selection of hotels anywhere in the area, the town is the natural place to stay for those not camping. Notable attractions include Bodie State Historical Park, Devils Postpile National Monument and Mono Lake - see panel on the right for a full list.